What an interesting day cooking and shopping with kids, but we got it done and had a wonderful dinner that we all enjoyed. Perhaps they will recall a few moments of cooking time, but if not they at least have a category of their own here to refer to and refresh their experience. This post is going to be long and boring to most, but important for my grands, so no offense if you choose to move on, but this is a fine memory moment with and for grands. Yes we begin with zucchini and roasted baby peppers using the same pan for both as they both called for EVOO. First the zucchini which is a Canal House recipe with a bit of a change…instead of pouring the dressing over the cooked zucchini, I put the garlic in the hot oil, heat off and let it sizzle for a minute then poured in the vinegar, heating slightly and finally pouring it over the zucchini for the marinating time. Toss in some fresh basil leaves, marinate at room temperature for at least 1 hour or refrigerate for several hours. 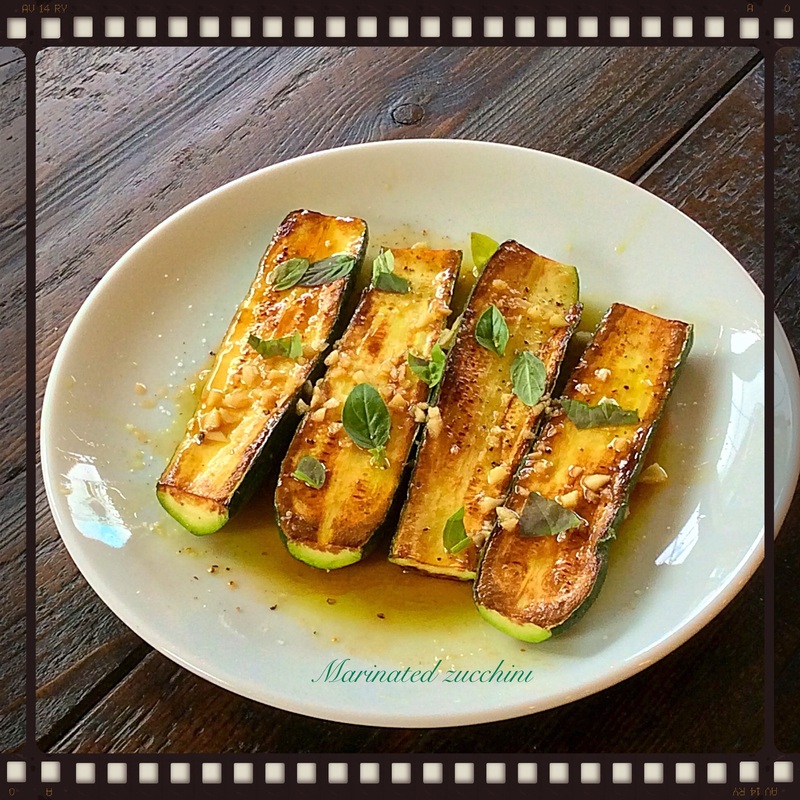 3 tablespoons extra-virgin olive oil, 2-3 medium cleaned and trimmed zucchini cut in 1/2, 2 whole cloves of garlic, peeled, salt, and pepper. Add 2 tablespoons of EVOO to a pan large enough to sauté zucchini halves, add zucchini sauté until golden (2-3) minutes. Turn and sauté for another 2-3 minutes (tender crisp). Remove zucchini to serving platter and season with salt and pepper. For the dressing, 1 1/2 tablespoons EVOO, and about 3/4 tablespoons red wine vinegar and two garlic cloves, minced. Add the olive oil to the hot pan along with the garlic, sizzle garlic for 30 or so seconds, turn off heat and toss in the vinegar, whisk and pour over zucchini add several leaves fresh basil toss to coat and marinate for an hour or cover and refrigerate for a few hours until serving time. 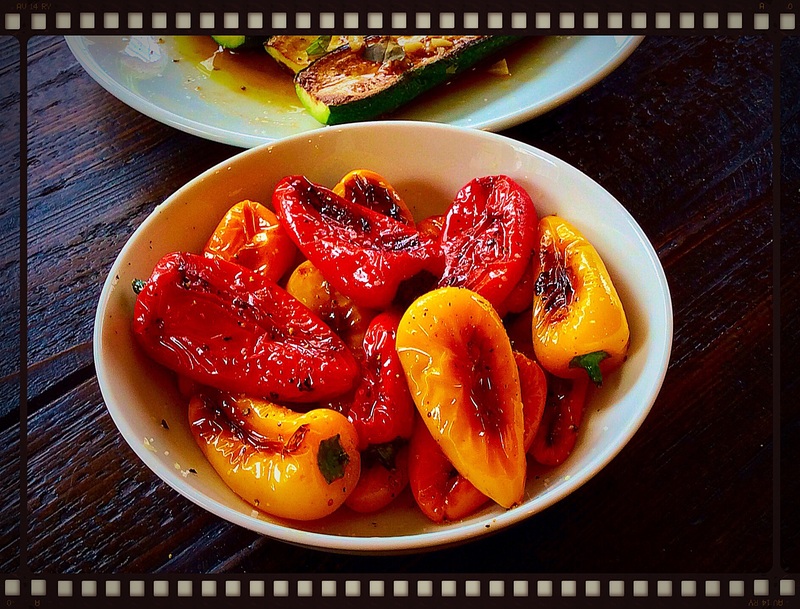 Easy roasted peppers: season small peppers with EVOO, salt and pepper, toss, oven or pan roast. 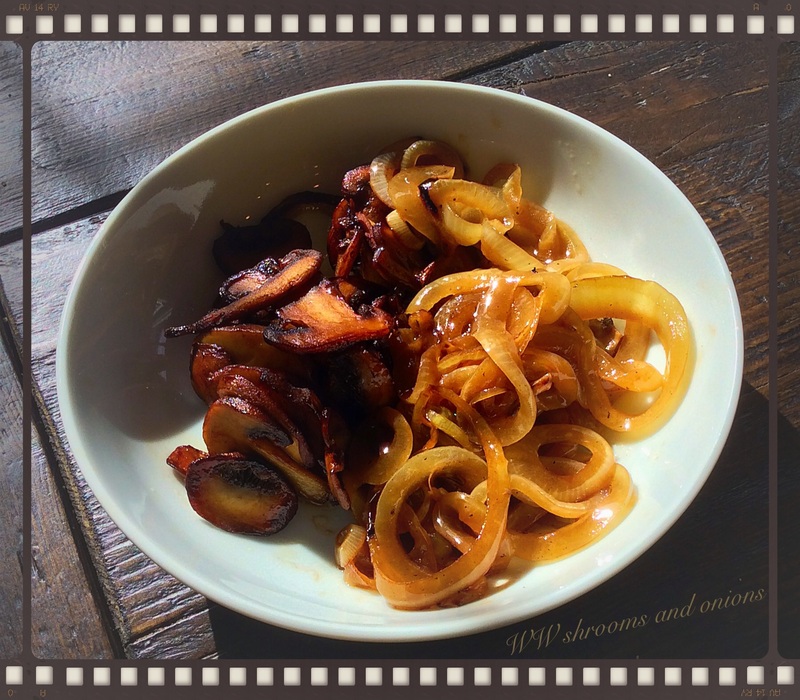 WW shrooms and onion: Ingredients…8-12 sliced cremini or assorted mushrooms that you care to sauté, 1 huge sweet onion, sliced, 1 fat garlic clove, 3 teaspoons EVOO, salt, pepper, splashes of Worcestershire sauce, 1/4 cup, white wine, and 4 tablespoons butter. Heat 1-2 tablespoon butter in sauté pan, add mushrooms and garlic clove, drizzle with olive oil and sauté turning now and then until a little crispy, splash in Worcestershire cook down for a minute. Remove to serving bowl. Sauté onions in the same pan adding another tablespoon of butter, season, and sauté until soft and golden. Splash in the wine and cook down until there is about 3-4 tablespoons liquid, swirl in the last of the butter and pour all over the mushrooms, toss and serve with great steak. 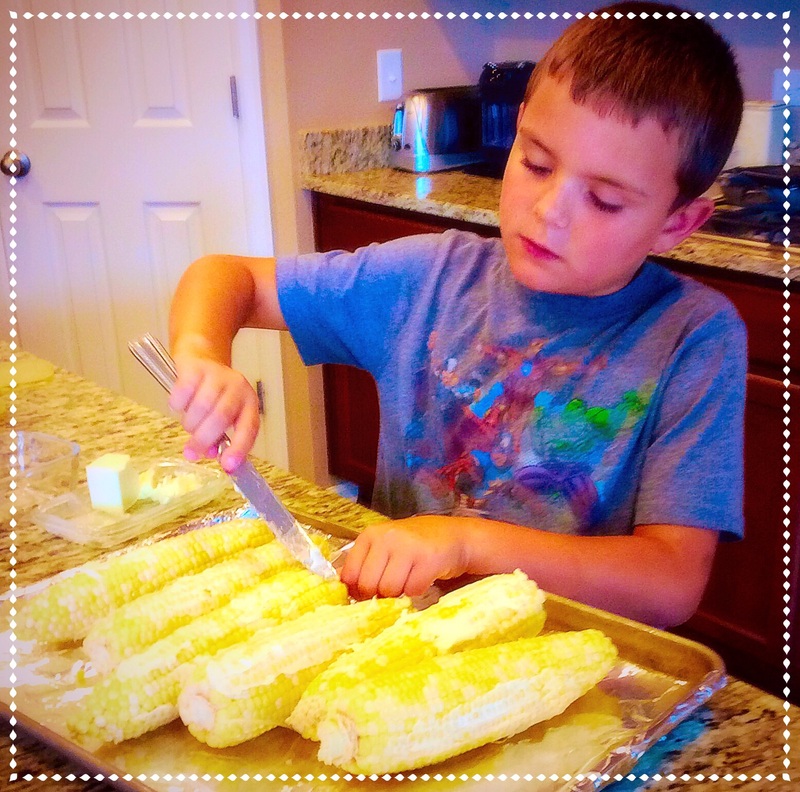 Hello Jacob’s oven roasted corn on the cob, corn for a party or corn for a few. Line a sheet pan with foil, add as many ears of corn that will fit on the pan, completely slather with real butter rain with salt and pepper. Roast in a preheated 400 degree oven fo 15-25 minutes turning. Shower the hot corn with grated Romano or Parmesan cheese. And you thought I was going vegetarian for a moment didn’t you? Well not happening and I have two steak lovers to share one fabulous NY strip…we all agreed on rare to med rare, yay no argument! 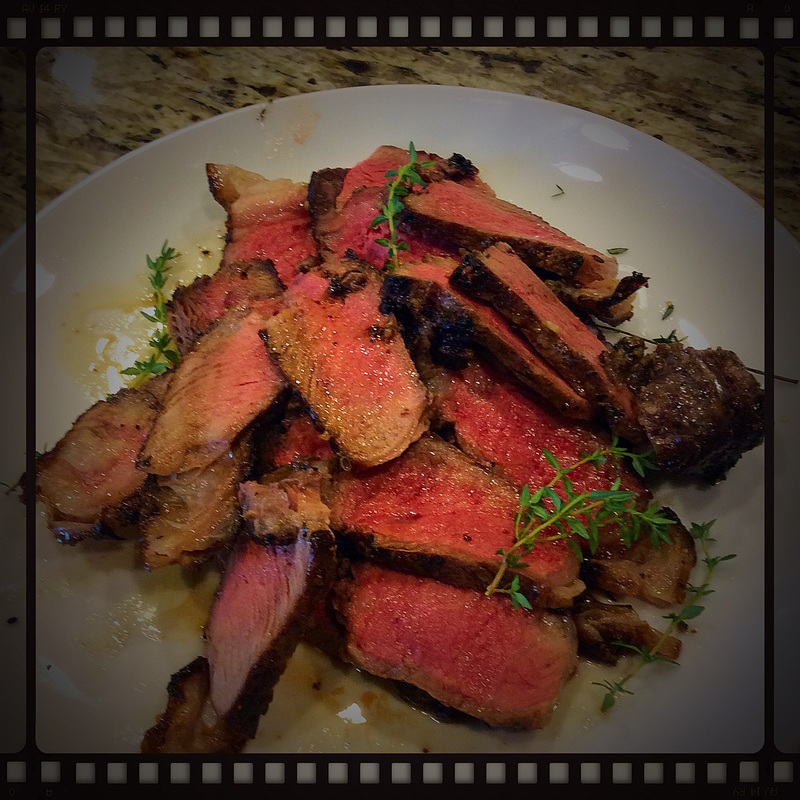 As for me it was a great opportunity to test my skills on pan sautéing and oven finishing a good steak with a nod to the importance of a well seasoned cast iron skillet….